This beautiful Gavroche took me by surprise, I thought that on me, it might perhaps be a little too bright. 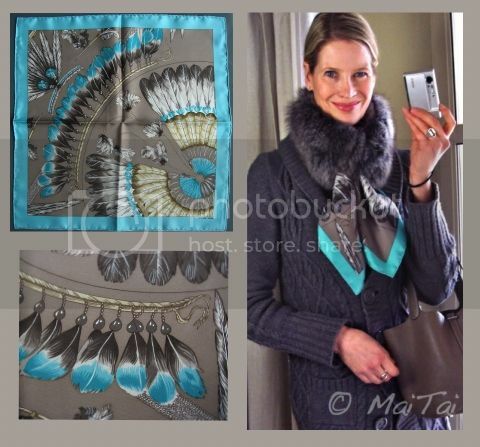 But when folded, the neutral colored background and feathers dominate, with the border just adding a splash of color. I bought it with spring/summer in mind, but as it was cold today, I teamed it up with a chunky knit and my Salt&Pepper fur collar. It brightened up a gloomy day in a wonderful way! Thank you DD, and you are so right re the enamel, should have kept it of course! Now, imagine a lagoon Bolide! However its not needed as you look totally breathtaking as usual, I love the way the colours all blend so well. Spring is on its way Mai Tai, she is just a little late waking up. You look gorgeous as always, and now we are scarf twins! I agree that this scarf is surprisingly 'neutral'. It also looks beautiful with my black fox collar. Unfortunately, it is too warm to wear fur. We have been having an early Spring, which started in January! Hey, great combination! My eye was caught by the colour of the scarf, but, you are so right; when folded it just gives a nice touch and blends in wonderfully. With a look like this spring feels coming nearer already. ...and it's a gavroche? It looks like a 45"x45" carré. However, great combination. Beautiful splash of colour, it suits you well, I love Brazil. Glorious MaiTai! What a breath of fresh air - perfect for this time of year! When I wear a chunky knit sweater, I look like a fisherwoman, but you look elegant! Thank you for your comment panoxia, and happy you enjoy my site. I think style and money are unrelated issues, and even though I am a big H aficionado, all techniques shown here will work with any other scarf too. IMO the secret to a chic look lies is the effort, and a 10 EUR scarf worn with flair and style can be absolutely traffic stopping gorgeous. Personally I enjoy mixing high end with low, the cardie is by Esprit ;-) Hope you'll continue to enjoy it here! We're twins on the Brazil II so I feel honor to share your good taste. Love your demo with the taupe sweater. Thanks dear.